As a child, my mother and I would go strawberry picking every June in search of picture perfect, plump, juicy strawberries. I considered myself a pro by age 7. This expertise was created from my first gut-wrenching experience in the strawberry fields. I was young and did not understand the difference between quality and quantity, so I was in a hurry to merely fill my basket. I did this, much faster than my mother, proudly smiling and running up to her to show off my overflowing basket. In one of the most memorable moments of my childhood, my mother proceeded to look at my basket, make a terribly disappointed face, and dump all of my berries onto the ground. As tears began swelling up in my eyes and laughter began surfacing on her face, she quickly reiterated that these strawberries were for our special project and only the good ones would do. Reluctantly, I looked down at my pile of mushy, moldy, deformed looking berries and started cracking up laughing right along with my mother. Present day: I decided to take on our special project without my ma’s help this year, in order to prove I can do it. In previous years, we had always used some type of pectin to ensure our jelly was the right texture. But this year, my boyfriend suggested we try the natural route, sans pectin. This involves a bit more work and plenty of patience but it is truly worth it in the end! *Leave stem on strawberries until using them to keep in flavor. Step 1: Wash and cut stems from each strawberry. Step 2: Mash strawberries into chunks, be sure to keep juice from strawberries as you smash. This can be done with numerous kitchen utensils, including a fork. I do not recommend buying anything special unless you prefer your jelly without seeds. Step 3: Place mashed strawberry chunks and juice into a large pot. Add sugar to pot of strawberries. Mix and set sugar and strawberries aside for at least a few hours. Upon return, boil for at least 5 minutes. Stir constantly to avoid sugar burning on the bottom. 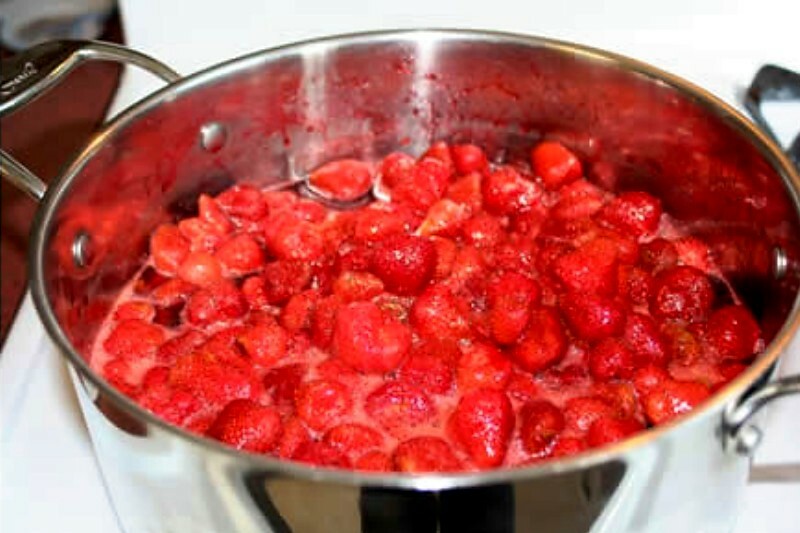 Step 4: After about 5 minutes on a full boil, use a sieve to remove chunks of strawberries, leaving only the juice in the pot to thicken and become syrup-like. Add lemon juice to pot. STIR OFTEN until desired thickness is achieved. *A test to see if syrup is ready is to spoon out a teaspoon of it and put it on a side plate in the freezer for about 5 minutes. If syrup is thick and wrinkles after running a finger over it, it’s ready. Step 5: Return strawberries to pot and boil on high for another 5 minutes. Step 6: Canning: Place jelly in hot jars using a large funnel for least amount of clean up. Leave ½ inch of space on top for sealing. Wipe jars clean before placing on lids and rings (loosely). Place in boiling hot water for 10 minutes to seal. Put on drying rack to cool. Remove rings to prevent rusting. Enjoy! ** This became such a hit with family & friends, I decided to put it in my Etsy shop. ﻿Follow the link on the right if you're interested! I want to try this without pectin. It looks beautiful in the jar. Thank you. Let me know if you try it. It's definitely worth the extra time in the kitchen. this recipe looks great! I never have success with homemade jam/jelly, sadly. This is the most delicious thing I've seen in a long time! Going to have to try this one... I wonder if it would work with stevia. Might give that a try sometime!